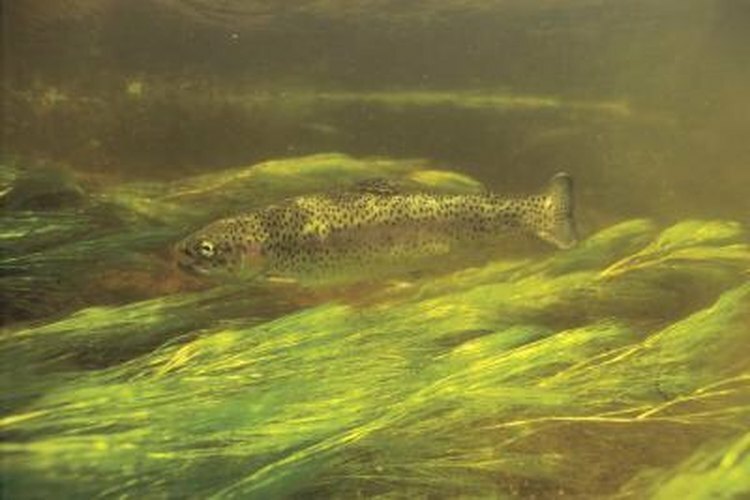 Trout use their sense of smell and vision to find food, according to the Missouri Department of Conservation. This is why many commercial trout lures and baits are available in a variety of colors and scents. While you have the option of purchasing scented bait, homemade scents can be easily added to lures to help increase your chances of catching trout. Trout can be finicky when it comes to fishing baits, and the bait that works well one day may not be successful the next. Almost every angler has a different idea about the best type of bait, but a few ingredients are often mentioned. Trout seem to be attracted to cheese, garlic and anise oil. While the scent of cheese is difficult to create in a liquid form, garlic and anise can be combined to create an inexpensive homemade liquid scent to make your lures more attractive. Mix up a batch of this simple liquid scent and soak your lures or plastic worms in the scent the night before you plan on fishing. Mix 1/2 cup of warm water and 1/2 cup liquid glycerin together in a shallow dish. The glycerin can be purchased at most drug stores; it will not add scent to the mixture but it will thicken the mixture slightly and help it cling to the lures. Add two tsp. of anise oil to the mixture. Anise oil is an essential oil that can be purchased from drug stores or health food stores. Anise oil is not the same as anise extract, which can be found in grocery stores. If you cannot locate the oil, use four tsp. of anise extract but keep in mind that it may not be as effective. Add two tbsp. garlic powder to the mixture and give it a quick stir. The garlic powder will not completely dissolve so the mixture may appear oily with sediment settling on the bottom. Place the lures into the mixture and give them a quick stir every few hours to help them soak up all of the scent. You can pour the liquid scent into a bottle or thermos to take with you to the lake and reapply it as needed. Use the scented lures the same way you normally would when you go fishing.